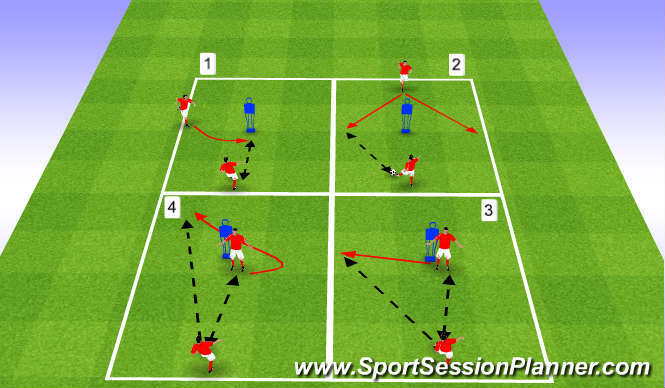 Football/Soccer Session (Moderate): Developing Play through Movement Off the Ball. 4 stations, players spend 4 minutes on each station. Players work for 2mins, recover (Serve) for 2. Can players’ play with a maximum of two touches? Players’ movement off the ball. Does player check shoulder/scan before receiving/checking? Play is the recycled to A1 who starts movement again. 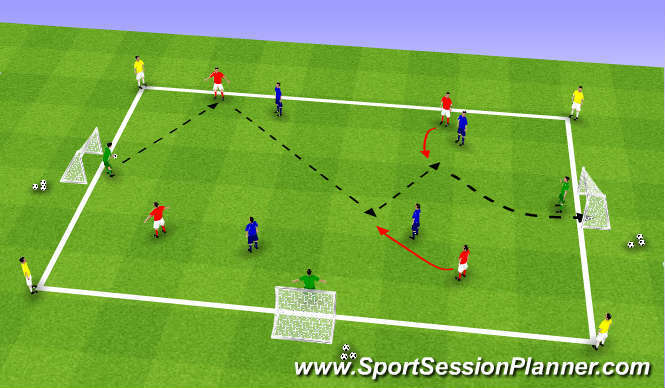 Angles of recieving pass/direction of first touch. Trigger movements for A3 and A4/A5. Can players&apos; play with a maximum of 2 touches? Can A5 finish first time/2 touch maximum. A4 plays pass into B5 who finishes. 2. A4 plays into B2 who &apos;sets&apos; A4, before playing pass into B5. 7 v 5 playing through the lines. 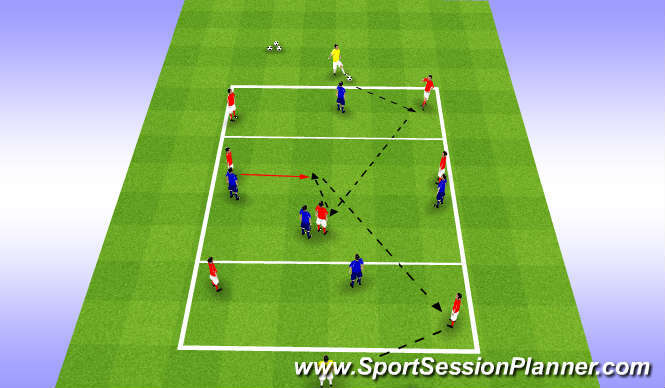 Red team must transfer the ball from one end man to the other, playing through the zones If defending side intercept they must find any end man. Play starts again with Red team. All players must stay within designated zones. Central players&apos; on half-turn when receiving. Movement off the ball when in possession. 1. One player from end zone can join central zone to create 4v3 overload. 2. One player/defender from receiving zone can drop into central zone to recieve. 3. Once ball has been used in central zone, players&apos; able to set back into first zone and play into end zone/man. 4v4 in central zone, with 4 neutral players on outside. Teams must score in a separate goal to where ball is distributed. Start Point is GK where goal is scored. Supply of balls behind each goal. Angles of receiving and body position to create goal-scoring opportunities. Rotation of players in transition. Can players&apos; move the ball quickly (2/3 touch)? 1. Outside players limited to 2 touch. 2. Outside players limited to 1 touch.